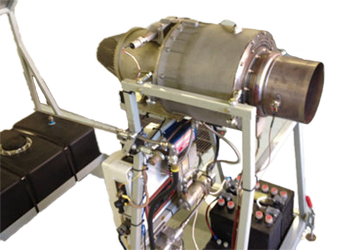 The Model AE-11-2 Turbine Engine Training System is a functional,scaled down turbine engine ideally suited for training applications. The engine is a small compact free turbine engine. The built-in safety features of this engine test stand make it suitable for educational use. The turbine engine comprises of a gas generator that incorporates a centrifugal compressor, an axial flow turbine rotating unit and an ignition and combustion system. The AE-11 is a self contained unit mounted on a sturdy steel frame, with caster wheels for easy mobility. The engine	RPM and thrust are controlled by a mechanical throttle. The control panel contains electrical circuit breaker and switches that are similar to the ones found in aircraft. The control panel also has engine instruments resembling aircraft installation, comprising of an EGT indicator, Oil Pressure indicator, Fuel Pressure gauge, Engine Thrust (in %), Tach indicator, Oil Temperature gauge, and Inlet Air Temperature gauge. Sensors are installed to measure the indicated parameters to acquire and to store the engine run-up data into the computer through a data acquisition hardware module. The data is represented in instrument display form as well as in a graphical form. This facilitates the instructor to explain engine operating parameters and the interdependence of variables. The Training system is provided with user manual, and extensive educational materials. A computer based training package (CBT) may be ordered as an optional item.